Metabolic Bone Disease: Another Rubber Tortoise! WARNING: THE VIDEO AT THE END OF THIS ARTICLE IS DISTRESSING AND FEATURES A DEAD ANIMAL IN A POOR PHYSICAL STATE. PLEASE WATCH AT YOUR DISCRETION. Virtually every week I am presented with a pet reptile which has an advanced disease relating to poor owner preparation or knowledge on how to keep these specialist animals. Today I had a tortoise patient booked in as a health check, but knew instantly on taking it out of it’s container that I would be humanely putting it to sleep as it had been suffering for a long time from metabolic bone disease (MBD) relating to poor husbandry and nutrition. I am angry, frustrated and weary of having to destroy animals that can be kept very successfully in captivity with a little bit of preparation, initial outlay of financial investment, research and common sense. I am astounded that I am having the same conversations over and over again with reptile owners who really don;t know how to keep the animals in their care, but have taken someone else’s word for it without doing extensive research of their own. 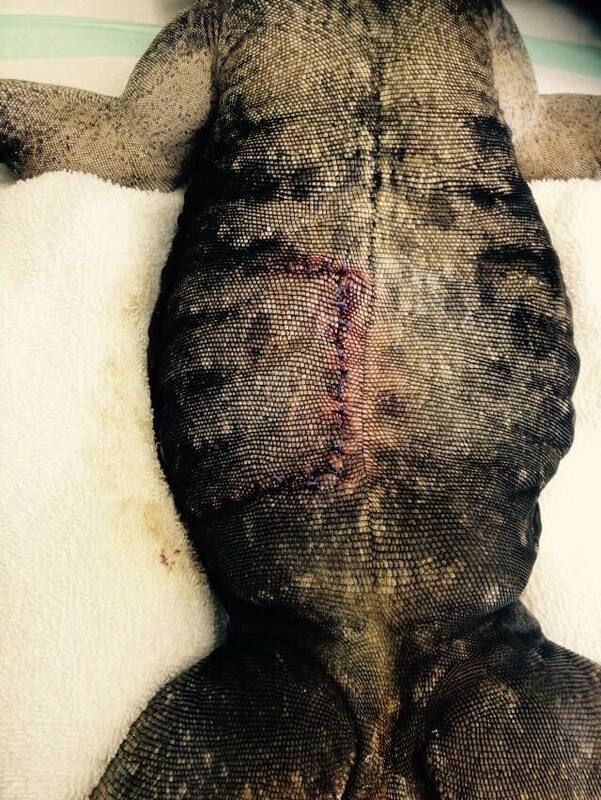 I will explain what led to this animal’s demise, and how it could have been prevented. I hope this post gets shared widely as the owner has kindly agreed I can share the story so that other owners may be educated and welfare improves for at least some animals as a result. 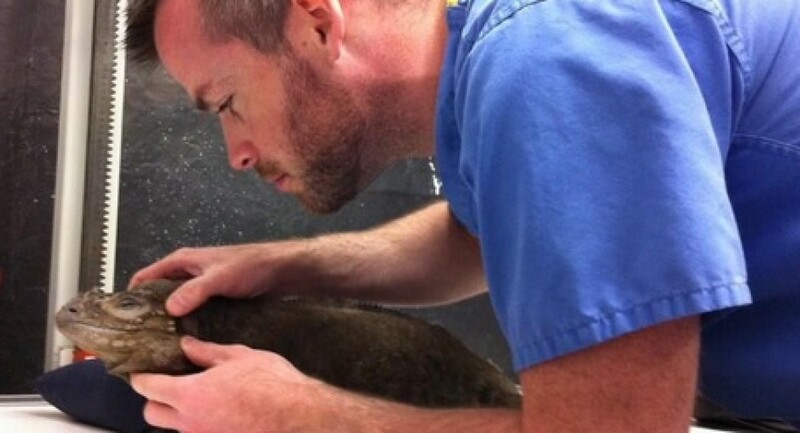 I have to commend the owner of this tortoise for at least bringing the tortoise to the vet. I’m sure many don’t and their animal dies slowly at home. My role as a vet is to educate owners and safeguard animal welfare, often having to be quite diplomatic in the face of pretty distressing cases of animal suffering. I recognise the tone of this post comes across as an angry rant, but I need to drum home an important message in the hopes I help some new keepers revise the care they are providing to their pet reptile and correct any issues before they cause such suffering as I saw today. Firstly, before I get to the details of this case let me explain a little about metabolic bone disease (MBD). MBD is a condition whereby an animal lacking in calcium, ultraviolet (UV) light exposure or both eventually becomes so deficient that it starts to absorb calcium from it’s skeleton and in the case of turtles and tortoises, it’s shell, in order to maintain normal metabolic function. Calcium is required for a variety of bodily functions including skeletal growth, neurological activity, muscle contractions and hormonal control for example. Reptiles in captivity are particularly vulnerable to MBD as they are reliant on their owners to provide them with artificial UV lighting, replication of a varied and natural diet, as well as appropriate calcium and other vitamin/mineral supplementation. The absorption of UVB light from natural sunlight allows reptiles to synthesise Vitamin D3 in their skin, and vitamin D3 allows them then to absorb calcium from their diet in the gut. This delicate balance between sunlight, vitamin D and dietary calcium sources is reliant on environmental temperatures, and is hindered if reptiles are kept in conditions which are colder than their preferred optimal temperature zone (POTZ). So you can appreciate that there is a fine balance between several interlinked factors that could contribute to the development of MBD when we take reptiles into captivity and take control of their immediate environment. Temperature, lighting and diet are the three factors that lead to the development of MBD. Get any one of those factors incorrect and you are setting your animal up for ill health. For further reading on this topic I can highly recommend reading the following book from leading reptile lighting specialists Arcadia: (www.arcadia-reptile.com/mbd-book-reviews/). REPLICATE THEIR NATURAL CONDITIONS IN THE WILD! Sounds easy, right? Well it is. But unfortunately there are a multitude of sources of information giving conflicting advice, a bewildering array of equipment and housing options commercially available, and an unfortunate trend in the reptile hobby of keeping animals in conditions which allow them to survive with minimal effort or expense. The aim of keeping reptiles as pets should be to provide them everything they need to allow them to thrive and flourish in as near natural conditions as possible, not just to survive with the minimum provisions they need. It is not up to the pet shop staff to give you the right equipment. It is not up to the guy on some forum who told you how to keep your pet alive. It is up to YOU to research the conditions your animal comes from in the wild, and how best to replicate them in captivity. There is no one perfect list or care sheet that does this work for you. Different keepers do things different ways. What you need to research is what temperature, humidity, diet and light your animal needs and then ensure you are providing that by monitoring the conditions in your particular set up. Just because someone does it their specific way and has had success, doesn’t mean you will achieve the same in your particular setup by following their lead. There are many variables that might affect your animal’s long term health. I have lost count of the amount of times I ask someone the question: “What temperature is your vivarium?” and am met with the reply “I don’t know, it’s warm”. A thermometer so you can record and monitor the temperature, and a thermostat to control the temperature are two vital pieces of equipment for providing the correct environment. A thermometer costs very little, a thermostat significantly more. But without them how do you know you are providing the animal with the correct range of temperatures it needs to survive? YOU DON’T! So you could be providing sub optimal temperatures sometimes or overheating your animal at others, resulting in biological stress and impaired immunity or overall health. If you have no thermostatic control of your vivarium, then the temperatures will fluctuate depending on conditions outside the vivarium in the room for example. Hence why advice telling you a specific wattage of bulb is suitable for a certain species is far too vague, as it doesn’t take into account how cold or warm the room in which the vivarium is housed tends to be. Rather, good advice should tell you the correct temperature range for your species, and it is up to you to find the correct bulb or other heating to achieve that temperature range that allows natural thermoregulation. UV lighting needs to be the correct intensity for the species of reptile being kept, needs to give enough exposure to UV rays by it’s spread and location in the enclosure and needs to be replaced frequently to maintain high enough levels in the enclosure. These bulbs also cost money. Diet needs to be researched. Convenient options often lead to long term problems. It takes time and significant effort, as well as significant expense, to provide a varied and natural diet. If you are not willing to invest this time, research, effort and expense into keeping a pet reptile, DO NOT BUY ONE! The reptile hobby as it stands is under increasing pressure from animal rights and welfare lobbyists arguing that these animals should not be kept in captivity at all due to the significant welfare problems they experience and the relatively high (often over exaggerated) mortality rates. I know many wonderful, knowledgeable and extremely capable reptile keepers as friends and as clients who provide amazing care to the animals they look after. 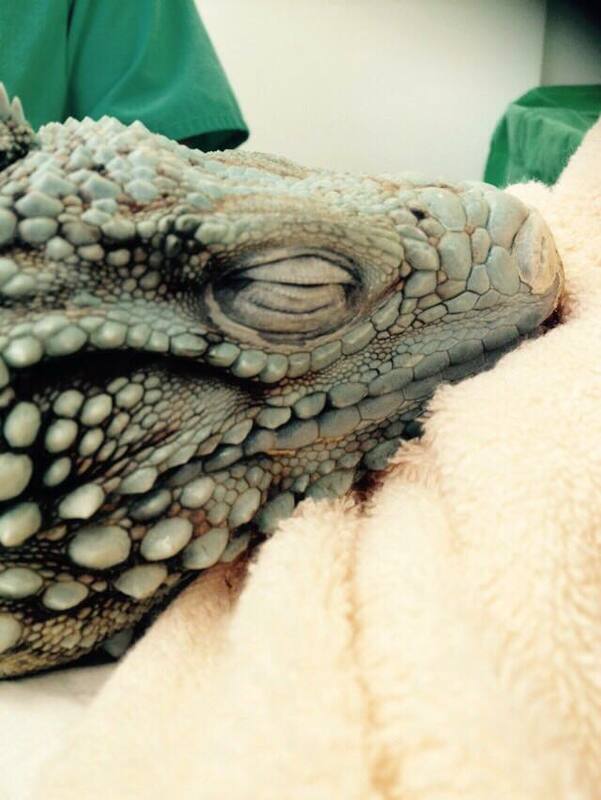 However, there is a massive welfare problem with captive reptiles which cannot be ignored. I see it in my line of work very frequently that beginner or inexperienced keepers are making very costly husbandry or nutrition mistakes which are costing the lives of a huge number of animals up and down the country every day. As a hobby, we are defensive when criticised by animal rights groups, but to ignore that there are huge welfare problems in the hobby is actually doing ourselves a disservice. Anyway, back to the tortoise I had to euthanise today. It was only a year and a half old and had been purchased from someone online. 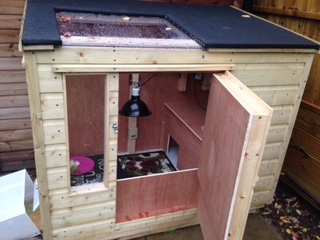 It had been kept in a vivarium with a single combined UV and heat lamp as the sole heat source. The owner didn’t know what temperatures were being provided. There was no thermostat. The pet shop staff told the owner that bulb was suitable for tortoises. The bulb had not been changed for well over a year. The tortoise was fed commercial tortoise pellets from a large plastic tub as it’s staple diet. It also ate lettuce and cucumber. No calcium, multivitamin or mineral supplements were provided. The owner noticed it’s shell was ‘looking weird’ around Christmas time. Today is the last day of March. It was brought in today because it had stopped eating. It had also stopped moving very much. It’s shell was very flat and very soft. TORTOISES SHOULD NOT HAVE SOFT SHELLS! IF THEY DO, YOU’VE BEEN DOING IT WRONG! 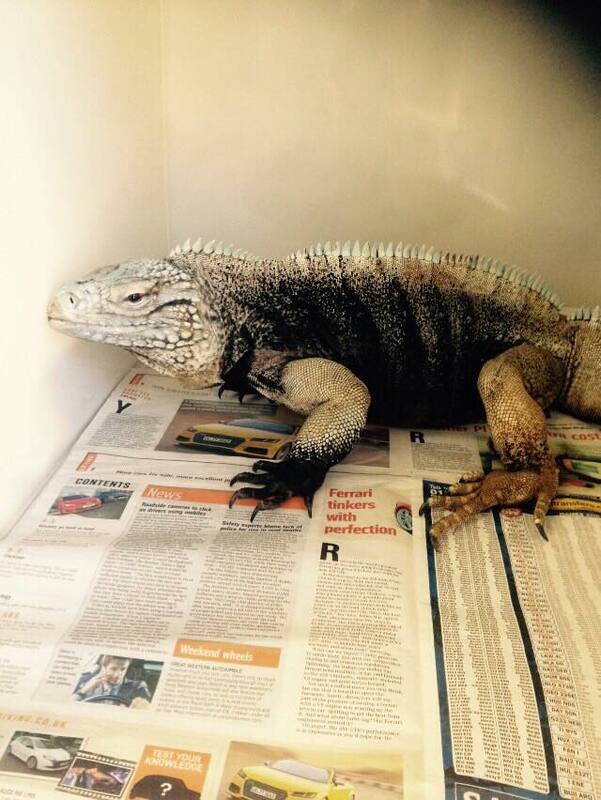 Why are we still seeing cases where reptile owner’s are doing it so wrong? Here’s my take on the above husbandry failings. You should research tortoise or any pet’s care long before you buy one. You should have read all available information, and asked as many questions as you can of experienced keepers until you are an expert on their care. Clear up any confusion you have before you purchase an animal. Don’t just listen to one point of view. Explore the theory, and examine the logic behind the varied advice you are given. Steer clear of prescriptive advice that tells you ‘X species needs Y type of bulb’. REPTILE HUSBANDRY IS NOT THAT SIMPLE! Mediterranean tortoises do best in large open topped well ventilated enclosures such as ‘tortoise tables’. Vivaria can lead to problems with temperature and humidity for Mediterranean tortoises. A single combination UV and heat bulb may work for some keepers who have mastered the pretty simple task of knowing and controlling the temperature correctly using a thermometer and thermostat, selecting the correct wattage bulb for their set up and providing a nutritious, appropriate captive diet with correct supplementation. It does not work for everyone, and I would argue that pet shops should not be selling these bulbs for beginners to keeping tortoises as these are the owners who are likely to get other factors such as diet wrong too. A preferable option is to provide a heat lamp and a separate UVB fluorescent tube which covers the entire length of the enclosure. That way the tortoise will receive UV light throughout the entire enclosure, even when it is not basking directly under the heat lamp. Tortoises do not bask in the one spot for long periods, they roam. By choosing a combination bulb your tortoise may not receive the optimal level of UVB exposure over time and therefore if your temperatures and diet are also somewhat deficient your tortoise will not thrive. It may even develop metabolic bone disease. Remember the intricate relationship between temperature, lighting and dietary balance? Take any one of those factors out or skimp on their provision and you are setting yourself up for a case of entirely avoidable MBD, among other potential health problems. If you do not know the temperature you are keeping your reptile at, buy a thermometer and find out. Pretty simple concept. If the temperature fluctuates widely in your specific set up due to external factors then buy a thermostat and make sure it is controlled. Yes, that costs money. If you can’t afford one, maybe you can’t afford a reptile. If you can’t afford one for your newest reptile, maybe you have too many reptiles. NOT KNOWING WHAT TEMPERATURE YOU KEEP YOUR PET REPTILE AT IS A COMPLETE NEGLIGENCE AS A PET OWNER. UV lighting needs to be changed on a regular basis. The bulbs give out light for long periods, but the output of the UV spectrum of light declines with time, generally over the course of 6-12 months depending on the manufacturer and quality of the bulb. Document when you buy new bulbs and when they need to be replaced. Young, actively growing reptiles in particular with high calcium demands cannot do well with a sub optimal level of UV light, even for short periods without suffering. Commercial pelleted foods are not a staple diet, they are a supplement to a healthy diet. Their nutritional content declines with time. They may be convenient for the owner as they sit in a tub ready to be poured into a feeding bowl, but tortoises need a variety of fresh greens, weeds, grasses, flowers and small amount of vegetables to thrive. Dry pelleted food is not a substitute for a fresh diet. Diets also need to be supplemented with calcium, and other vitamins and minerals that may be lacking in the limited diet we invariably provide in captivity. Lettuce, cucumber and tomato is an extremely poor diet as it has a high water content but very few valuable nutrients. As an aside which is unrelated to this case, I hear from time time time about the act of feeding tortoises dog and cat food. NEVER FEED ANIMAL PROTEIN TO HERBIVOROUS MEDITERRANEAN TORTOISES. (Jam sandwiches or chips are also off the list. I’m not joking!). If you notice your tortoise or other reptile pet acting or looking strange, then BRING IT TO THE VET! Don’t wait until it can’t move or no longer eats. Don’t wait until you’ve read a few articles and self diagnosed it, then tried to treat it at home. Don’t ask other hobbyists on five separate internet forums until you hear get the answer you want or whatever other DIY home treatment option you might try first. IF YOU CANNOT AFFORD VETERINARY FEES, YOU CANNOT AFFORD THE PET! Reptiles hide illness very well to avoid predation int he wild. If you think they are sick, they are probably sick. 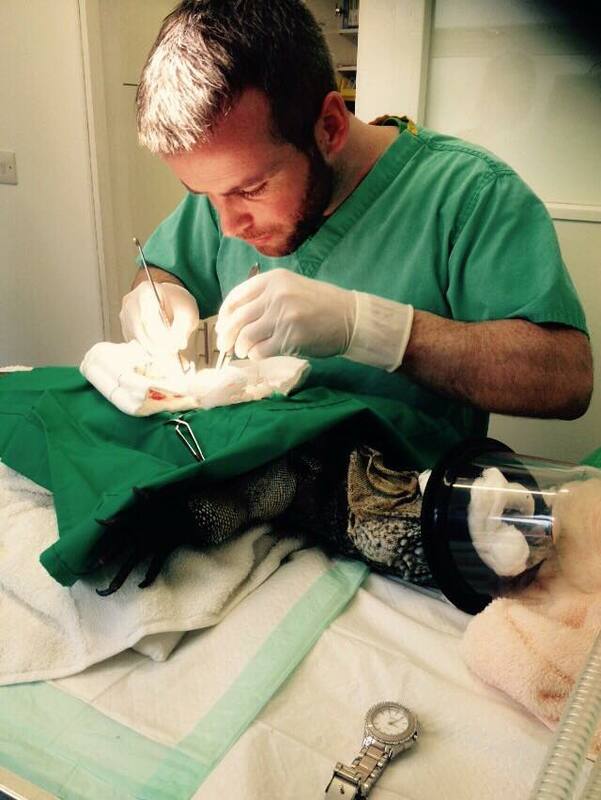 Seek a qualified and experienced reptile vet at the earliest opportunity and work with them. Don’t lie to them or withhold important information that could aid their diagnosis (this happens a lot too, though not in this case). A deformed or misshapen shell in tortoises and turtles is always indicative of a problem. If the shell is softening this problem is advanced. This tortoise today had a softened, flattened shell like a rubber ball. This did not happen overnight. The owner noticed at Christmas that something was wrong. But only brought it in to my clinic when it had stopped eating and stopped moving. The tortoise was so deficient in calcium over a long period of time due to poor heating, poor lighting and poor diet that it had absorbed it’s shell and skeleton of calcium, thus softening the bones to the point they could no longer support it’s body weight. It was undoubtedly in immense pain. It was having to pull it’s forelimbs back and forth to try to keep breathing as it’s collapsed rubbery shell was compressing it’s lungs and causing respiratory distress. It was undoubtedly in multi-systemic organ failure at the tender age of 18 months. It had the potential to outlive it’s owner, it’s owners children and potentially grandchildren if a little more research and effort had gone into it’s care. Sadly, it was beyond help, and I have to take comfort in the fact I could relieve it’s suffering and put it out of it’s misery humanely. I am however, still angry, jaded, frustrated and tired of seeing this problem crop up over and over again whilst trying to maintain an upbeat, positive demeanour that will help educate the owner rather than turn them against the idea of veterinary care. Below is the video of the tortoise which may be distressing to some people. Please view at your discretion. Please also note that I took this video AFTER the tortoise had died, so it is no longer suffering. It is explicit to show the extreme changes that can occur with MBD as a direct result of poor husbandry and nutrition. If it makes one person improve the care of their pet tortoise it will be worth posting, so please feel free to share this article. Mediterranean tortoises are rousing from hibernation this time of year, and really need conditions to be correct in order to thrive and return to good health following a long period of fasting and dormancy over winter. The critical factors which must be provided correctly to ensure they return to good health and begin eating promptly after waking are provision of appropriate heating and lighting. If keeping them outdoors in the garden straight away after waking from hibernation, they really are at the mercy of the British weather; often too cold and too wet to kick start their metabolic rate which is heavily reliant on external temperature. If tortoises don’t receive the correct heating and UV lighting in this critical period, they often fail to regain appetite, immunity declines, they can become dehydrated and burn off even more of their already depleted energy reserves leaving them prone to infections and organ dysfunction, failure or even death. It is therefore critical that supplemental heating and lighting is provided with a heat lamp and UV light for any period when the British weather is poor, but especially so in the immediate post hibernation period in Spring. Last weekend I had a post hibernation check in a lovely 30 year old Spur-thigh tortoise named Mr Slow. 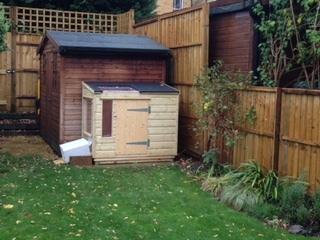 He was the picture of health, and his very caring owner had commissioned her handy neighbour to build him a state of the art tortoise house in the garden which catered to all of his needs mentioned above. As you can see from the photos below, he has a beautiful house with thermostatically controlled, weather proof porch leading to a covered sleeping area. He has a combined heat and UVB lamp under which to bask which is on a timer, and a special UVB penetrating Perspex sunroof for natural sunlight exposure even on cold days. 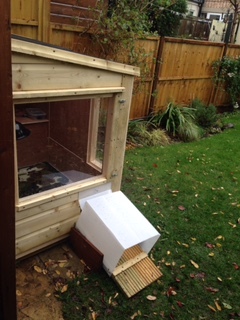 A ramp leads to the enclosed escape-proof garden for when it is warmer and he wants to head off and explore! 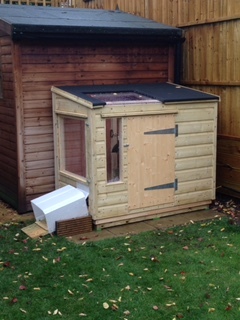 Luxury digs indeed….. Evolutionary Ramblings Part 2: Birds and the magic of flight! 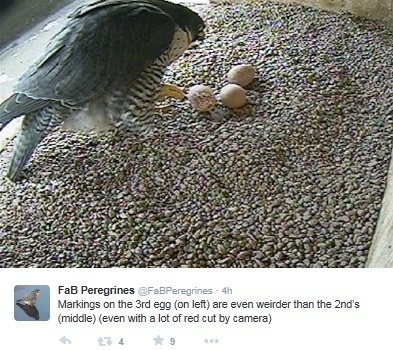 I’ve been watching the pair of peregrine falcons nesting on Charing Cross Hospital a few times in person when I’ve been passing recently and remotely via the wonderful Twitter account @FaBPeregrines as well as on their website (http://www.fabperegrines.org.uk/). It has fantastic CCTV footage showing their nest and breeding efforts, where in recent days there has been some unusual activity. The female, Charlie has been worrying everyone as she has been laying eggs many days apart rather than on a regular schedule as in previous years. It is unknown whether this years breeding attempt will be successful with the eggs hatching, but the pair are currently incubating the clutch of three eggs with the male falcon or tiercel, Tom, providing food and allowing Charlie off the eggs to take breaks from incubation. Have a look yourselves! It should be an interesting story if we get to see the chicks grow and take flight later in summer. Speaking of flight, watching Charlie caring for the eggs and leaving the nest earlier, it got me thinking about the evolution of flight and the vulnerability of those eggs in the nest when left unattended. My first thought was that laying eggs allows the female bird to maintain her ability to fly as carrying foetuses in gestation until fully developed would weigh her down. But perhaps it is more accurate to say that the evolutionary step the reptiles developed of laying hard, shelled eggs to come out of the water onto land allowed them to later evolve the advantage of flight and turn into birds by taking to the skies! Virtually everything about a bird’s anatomy and design is aimed at maintaining a light body weight capable of flying through the air. Even today’s flightless birds such as penguins, ostriches and Kiwis demonstrate specific adaptations of this order of animals which makes them unique from other orders such as reptiles and mammals. The defining characteristics of birds in general relate to the ability to fly. Other animals however can fly to varying degrees. Bats for instance are the only mammals capable of true flight. Various other species such as lizards, frogs, flying squirrels and so on glide rather than truly fly. So aerial mobility is not unique to birds. Flight is not unique to birds. The distinctive or unique characteristic of birds is the evolution of the feather as a flight aid. 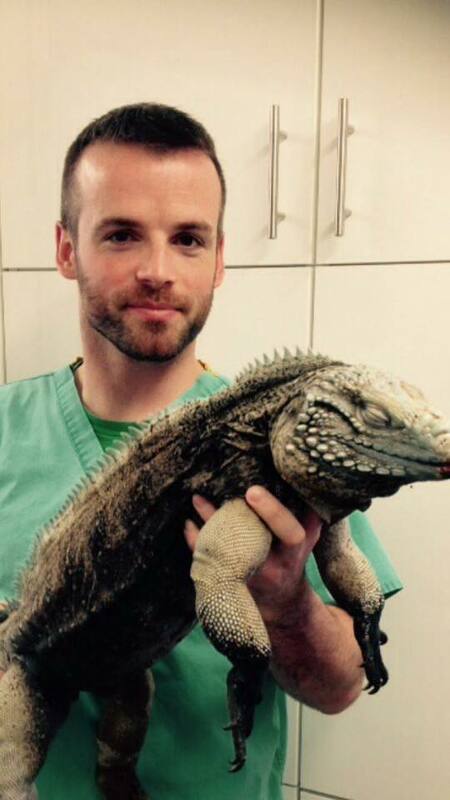 A Reptile Dysfunction: An Iguana’s bladder problem. A 7 year old male Cayman Islands Iguana presented to my clinic with a very experienced and knowledgeable owner who has kept various Iguana species for many years. This specimen was usually quite aggressive and active but for the previous few days had been lethargic, quiet and non responsive to the owner during routine husbandry tasks and feeding. In fact he had refused to eat anything for 2-3 days, so the owner knew something must be seriously wrong. When I examined him he had a small abrasion on his chin, but other than that there were no external abnormalities and he looked outwardly like a very healthy lizard. However, when we restrained him for closer examination I managed to palpate a large firm mass in his ventral abdomen which was definitely abnormal. 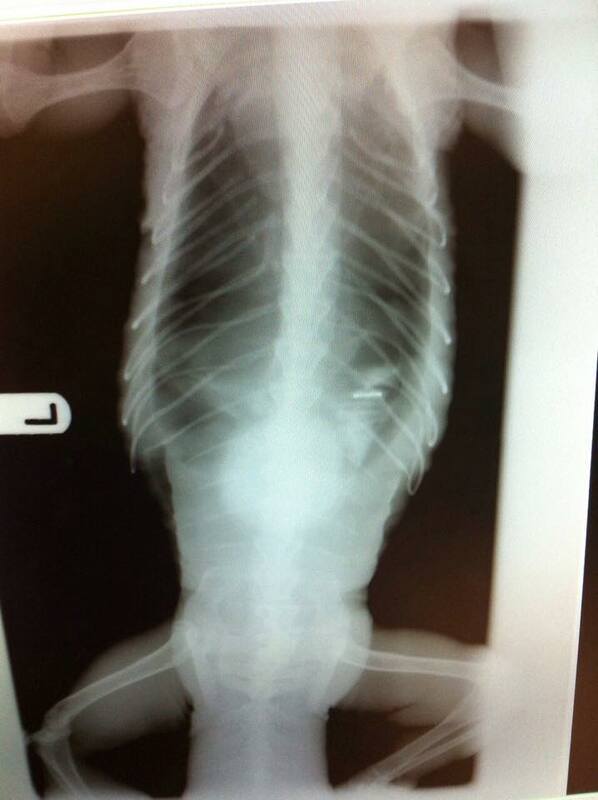 I gave him some gaseous anaesthesia and took an X-ray to try to find out what this mass was. The X-ray revealed a large, round, irregular, solid mineralised opacity in the mid abdomen cranial to the pelvis. The margins of the mass were somewhat ‘fluffy’ or sclerotic however so it did not have the typical appearance of a smooth mineralised bladder stone or urolith, although the shape and location was consistent with this possibility. However, due to the strange appearance and the fact that certain tumours can become calcified, I was not 100% certain on a firm diagnosis of a bladder stone or tumour without further investigation. After some discussion with the owner, it was decided to perform an exploratory surgery and treat according to what I found if possible. The owner had raised this magnificent animal from a baby and was not willing to give up on him without a firm diagnosis and exhausting all possible treatment options. I proceeded to anaesthetise him with an injectable sedative and analgesic drug combination, and maintained him on gaseous anaesthesia after admitting him to hospital and getting him warmed up to allow him to metabolise the drugs effectively. I also administered some further long lasting pain relief to keep him comfortable in the post-operative period. Upon opening his abdomen, I discovered that the mass was in fact a very enlarged bladder, but luckily it was not a tumour. Rather, there was a solid mass occupying the entire lumen or space contained by the bladder walls, but it was not attached. Strangely the mass was friable or soft when squeezed through the bladder wall. I performed a cystotomy incision through the bladder wall which revealed the surface of a large abscess; the typical caseous or solid, cheese-like pus material that reptiles produce was visible on the surface at least. 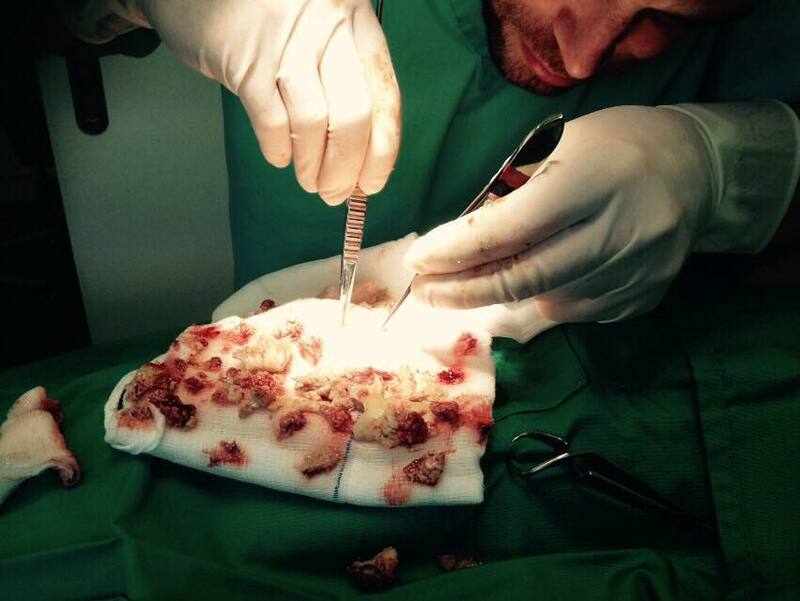 Some of this flaked away to reveal a calcified urolith or bladder stone just below the surface of the abscess. I had to extend the incision to remove a large stone from within the centre of the infectious hard pus capsule, before painstakingly removing this pus piece by piece from the depths of the large distended and inflamed bladder. 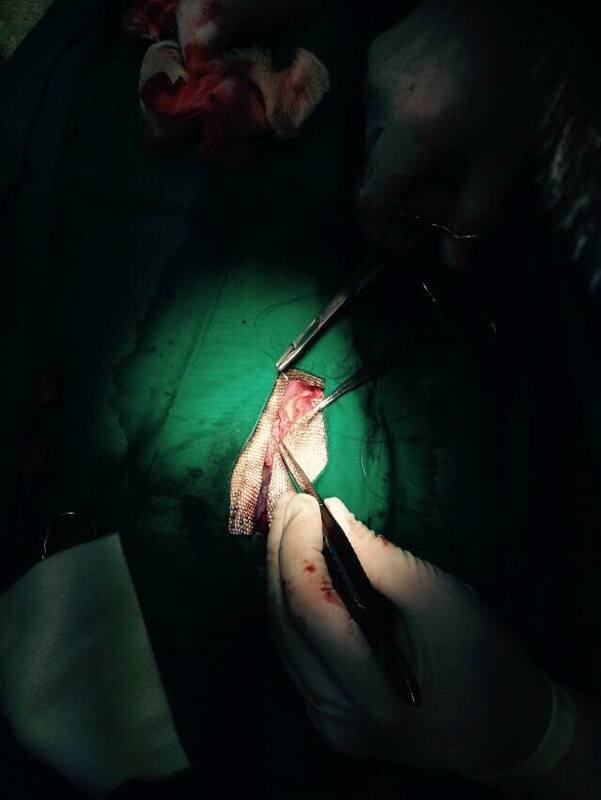 Once I had removed all solid material I carefully flushed the bladder to remove as much infected material as I could, before closing the bladder incision with a two layer inverting suture pattern to prevent leakage into the abdominal or more correctly termed coelomic cavity. Reptiles do not possess a muscular diaphragm separating the thorax (chest) from the abdomen like in mammals, so the common single internal cavity containing all the organs is called a coelom (pronounced ‘see-loam’). I then flushed this coelomic cavity to again minimise any contamination by the infection within the bladder. I administered antibiotics having taken a swab for culture so that if an infection occurred post-operatively I would know what next antibiotic to treat it successfully with. I gave him subcutaneous warm fluids both to hydrate him after surgery and keep his temperature up so he would recover quicker, along with keeping him warm throughout the operation with a heat mat and pads surrounding him. I was worried that his kidneys could be affected by pressure from the blocked bladder as well as ascending or tracking infection, so needed to ensure he was maximally hydrated by flushing his kidneys through with fluids. 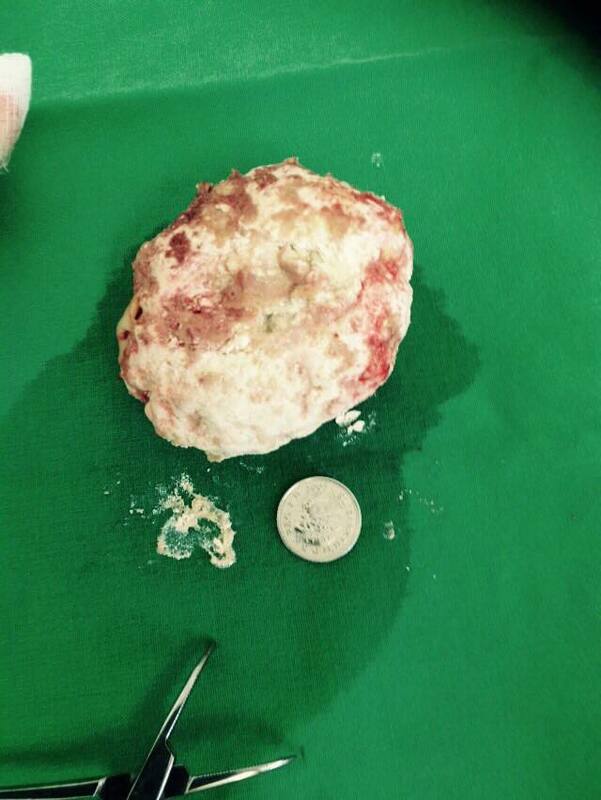 Central urolith removed from within the bladder abscess; a calcified hard chalky stone (with 5p for scale). Once I had flushed and was confident most infection had been removed, I closed the trapdoor type incision I had made to gain access to the lizard’s internal organs. He recovered slowly from his ordeal, as it was a long surgery and also having systemic infection he was somewhat debilitated. Happy surgeon and sleepy patient about to go to warmed hospital enclosure for recovery. The next day however he was back to his usual feisty self and went home to his capable owner with oral medications. He has thus far made a very good recovery and his owner reports that he is as aggressive as ever and tucking into plenty of food so seems to be doing very well. Certain dietary ingredients can predispose to urolith or stone formation, as well as genetic factors so the owner will be re-evaluating his diet to prevent risk of recurrence in future.